Paul Ryan’s opportunity grants: The Wisconsin Republican says his poverty reform proposal won’t cut money for the poor, but history says otherwise. Paul Ryan is promising his sweeping poverty reforms won’t mean less money for the poor. History says otherwise. 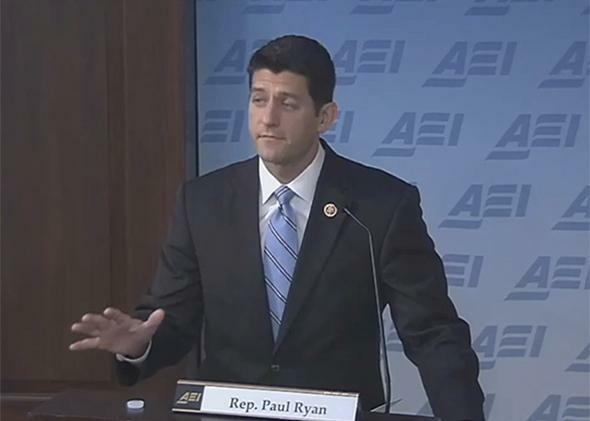 Rep. Paul Ryan speaks at the American Enterprise Institute on July 24, 2014, in Washington. The Wisconsin legislator also offered a second message to Democrats listening on Capitol Hill: Any state that opted into his pilot program, Ryan vowed, “would get the same amount of money as under current law—not a penny less.” That promise was aimed at putting his colleagues across the aisle at ease and enticing them to join his reform-minded debate. The problem is that there’s little to suggest that Ryan would keep his promise—in fact, history suggests he wouldn’t be able to even if he wanted to. Ryan’s deficit-neutral pledge doesn’t extend any further than the specific, 73-page “discussion draft” (as he’s calling it) that he was waving from the American Enterprise Institute podium. The three-hole-punched elephant in the room was another lengthy white paper the House Budget chairman wrote: his 2015 budget blueprint, released less than four months ago. That proposal called for $137 billion in cuts over the next decade from the federal food stamp program, now known as the Supplemental Nutrition Assistance Program. A cut of that size—nearly a fifth of SNAP’s current budget—would mean millions of low-income Americans would lose at least some, if not all, of their benefits. That’s because the accountability of Ryan’s block grant switch comes with something he appears to covet even more: an end to food stamps as an entitlement program. Under the current setup, any American who qualifies for SNAP benefits receives them, regardless of how much money Washington has already spent on the program that year. But switching to a block grant would effectively set a cap on SNAP spending by stopping the program from automatically increasing along with need. That, critics warn, could leave the program unprepared and underfunded when the next economic downturn sends more Americans than expected scrambling to put food on the table. And that’s not the only reason that the anti-poverty crowd should be nervous. As Vice President Joe Biden’s former chief economist Jared Bernstein has already warned, once you put all of the social welfare programs in one package, you give lawmakers a single target to train their budget-cutting sights on. While Ryan’s plan may not explicitly cut the social safety net, it would make it much easier for him and his colleagues to do so in the near future. To be fair, Ryan’s proposal contains a number of common-sense reforms that already have support from both sides of the aisle, things like sentencing reform and expanding the Earned Income Tax Credit. But if Ryan means it when he says he hopes his proposal kicks off a good-faith bipartisan debate about how Washington can better combat poverty, he’s going to have to make it a more honest conversation than he did on Thursday. The 47 million Americans currently living off of food stamps deserve at least that much.